It's starting to become rather cliché for me to say that it's been a long week... but it does seem like last weekend was a long time ago! I can't seem keep up with real life virtually; I still have pictures ready for the gallery from weeks ago, because I still haven't got around to writing a blog post for them! In my last post (on Saturday), I mentioned that preparations were underway for James' 10th birthday party. He had invited a small group of close friends from school for "Star Wars"-themed festivities. Not that there was any particular structure to the activities-- the "concept" was basically this: minimal decorations, snacks, and cheap plastic swords for all with which to entertain themselves. The swimming pool (although absolutely gelid! ), along with the Playstation 2 and computer games, rounded out the day's recreation. We have a certain amount of experience with this kind of event and I can affirm with authority that kids (at least, boys!) in this age group know how to entertain themselves if you allow them some space. Of course, the "space" in our case was the area in and around the construction site, with the specification of a couple of "restricted areas". Luckily there were no major injuries! The pictures of Saturday's diversions can be seen in the gallery: click here. Sunday evening was the celebration with the family (at least, the portion of the family that was present! ): The idea was to hold an "intimate" dinner with just family members: Ana and her kids, Ana's boyfriend Sergio, Celinho (Cristina's brother), and their cousin Luciano ("Lu") with his girlfriend Renata. Unfortunately, you can't really call anything "intimate" when Kevin is present: his antics manages to draw attention to us wherever we go! James was allowed to choose the restaurant, in honor of his birthday: "Joe & Leo's" just barely edged out Outback Steakhouse; mostly because "Joe & Leo's", styled as a genuine American sports bar and grill, specializes in classic hamburgers, which is what James likes most. But also because of its location: with a view from the mezzanine of Rio's elite "Fashion Mall", it looks out on "Pedra da Gavea" and the green slopes of Tijuca Forest. Christian approved James' choice because Joe & Leo's also has the "smiley fries"! By their choices in restaurants, you can see how strong the gringo influence is in the family! Unfortunately it was raining torrentially and dark, so you couldn't see much of the view; but the dinner, in spite of Kevin's difficulty in remaining seated, was enjoyable for all. To top it all off, James and Christian were allowed to spend the night with cousins Bruno and Mariana afterwards, and skip school on the following day. All in all, a great birthday weekend for James! The pictures from dinner at Joe & Leo's are here. HAPPY ANNIVERSARY Celio & Cléa! Today, September 29, is Celio & Cléa's 43rd wedding anniversary! One frustrated attempt was made to contact them today ... and now it's really late ... but our congratulations and best wishes to the both of them on this special date! Oh yeah ... (referring to the picture above) ... I figured out how to do a cool light saber effect in photoshop! (it's pretty easy!). You can click on the picture above to see a larger version. Nice lightsaber effect, indeed. 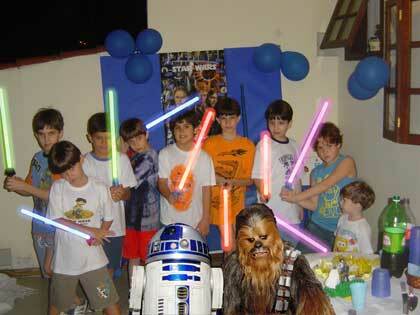 Looks like a blast, just the kind of party I'll have for Ben when he's older (if he likes Star Wars, I supposed). Reminds of one time we went to a local Wal-Mart because they advertised that some stormtroopers and Darth Vader would be there for a photo op with kids. When we got there, it was a cardboard standup of Darth, with a small voice-changing box the kid could speak through if he stood behind it. I spoke through it, of course, but it did nothing for Ben. Oh well. Who was Chewie at your party?